News has broken overnight that Sabine Kerkau is to be inducted in the Women Divers Hall of Fame. It is rare that a non-USA diving female's work is acknowledged by this non-profit organisation. 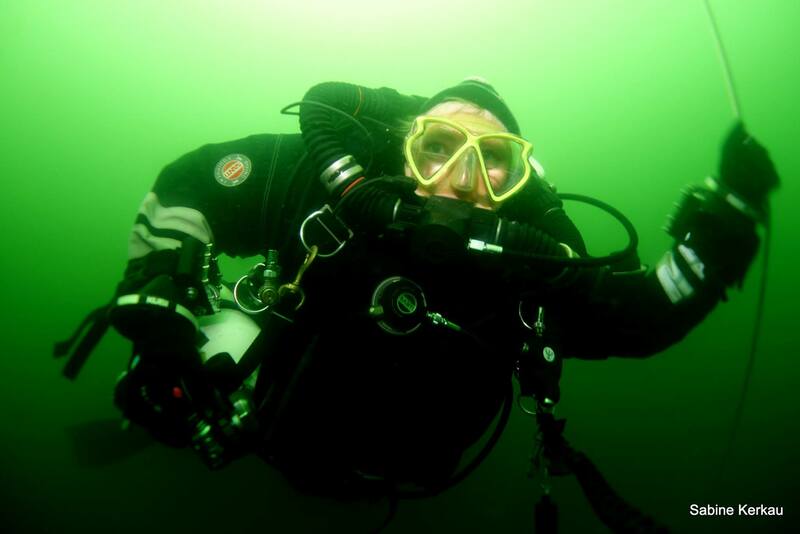 Kerkau is a diving journalist, more specifically, a technical diving journalist. There are very few of these specialist reporters, and even fewer female techie correspondents. Kerkau is an intelligent author. She keeps the wreck or cave centre stage, and gives it maximum exposure. The articles written by Sabine always have rich content. Kerkau is a consummate cold-water (6°C / 43°F) deep (100m / 328ft) CCR diver. It takes a certain amount of resilience and grit to conduct long decompression stops of 60 minutes, especially in these kind of water temperatures. Whilst technology, i.e. heated devices, and modern thermal underwear help make the job more bearable, you have got to really want to do this kind of diving. You cannot just blow off decompression obligations and climb out of the water because you are cold. 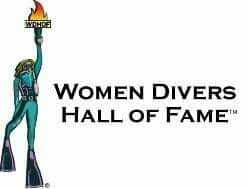 The Women Divers Hall of Fame seeks to recognize the outstanding contributions that women divers have made in the exploration, knowledge, safety, enjoyment and preservation of our underwater world. Sabine Kerkau learned to dive in 1987 in the Maldives, and she spent a number of years diving for fun in the Mediterranean, Caribbean and German lakes. She turned pro in 1995 when she became a PADI Divemaster, and passed her PADI Open Water Scuba Instructor exam in 1996. She followed the path that many of us have, working as a part-time instructor and leading groups to dive Malta, Egypt and Croatia. During this time, she developed a passion for wreck diving, and she began to write and photograph her dives. This did not go unnoticed, and her work was picked up and published in German-speaking areas. It meant that she was soon diving deeper, and she qualified as an open-circuit trimix diver in 2001. Rebreathers are now a standard piece of equipment for many of us. It is a smarter way to use gas and breathe the best mix, enabling us to explore and dive deeper and for longer periods of time. Kerkau quickly realised she needed this tool for her job, and qualified on rebreathers in 2006 in order to document and write about wrecks beyond 100m. Her skills and projects really inspire many divers. Kerkau is therefore a cold-water, deep-expedition wreck and cave diver. For the past 13 years, she joined key expeditions around the world, and has dived iconic wrecks such as HMS Britannic (Greece) and HMS Victoria (Lebanon). Kerkau was a member of the MINEQUEST 2 project in Newfoundland, working alongside WDHOF member Jill Heinerth. It should be noted that this was an Explorers Club Flag expedition. Currently, Kerkau is part of a team exploring the deep (180m / 590ft) flooded Gonzen Mine in Switzerland. She has also dived the Tuna Hastberg Mine (Sweden), Pozo Azul (Spain) and caves in Thailand. In October 2013, she did her deepest dive in a cave—125m / 410 ft in the Sang Hong Cave. Today, Kerkau is respected as a technical diving writer for Divemaster, Tauchen Magazine, WetNotes, Underwater World, Unterwasser Magazine and X-Ray Mag. Earlier this year, she was covering the world apnea record dive by Peter Colat and was asked to join the team as a backup diver. Only the best are asked to babysit free diving records because these dives can go badly wrong in seconds. "Sabine Kerkau, for all her underwater explorations and subsequent documented and vivid publications. She is also a very good underwater photographer." "She is doing a very good job and brings tech diving to divers." "Sabine has dived all over the planet and has excellent photo documentation and write ups." "She is a person with a huge interest in showing the underwater world through the media." "Sabine devotes all her energy to discover and report on new and interesting dive sites." "Tireless diver around the world, incredible diving and incredible videos and reports." "Inspiring, continuous and tenacious work." "A fantastic diver that give us pictures of amazing places!" Kerkau regularly speaks at diving events in Europe. These include Tekdive (Belgium), the Advanced Exploration Diving Conference (Greece), Rebreather Reunion Hemmoor (Germany), Boot Show (Germany), Dive Show (Moscow), Lithuania Sea Museum and Tek Event Tunersee (Switzerland). 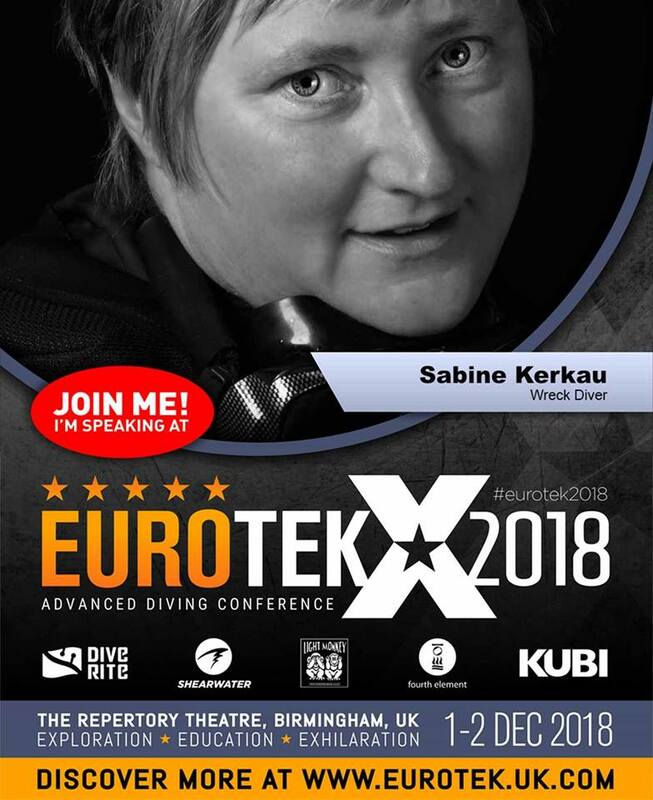 This year, she is speaking for Scubapro at their Innovation Day and the European advanced and technical diving conference, EUROTEK. Kerkau recently co-founded the Baltic Sea Heritage Rescue Project. This is based in Lithuania and it has two roles: firstly, to detect and recover ghost fishing nets and ensure that they are properly disposed of; and secondly, to search, identify and protect wrecks. This is a joint visionary project with fisheries associations and local fishermen to protect the ecosystem of the Baltic Sea. Kerkau is therefore working with the Ship History Department and the Klaipeda University Institute of Baltic History and Archeology. Her passion transmitted through Wetnotes: astonishing tech dives around the globe. She's an example, a guide. 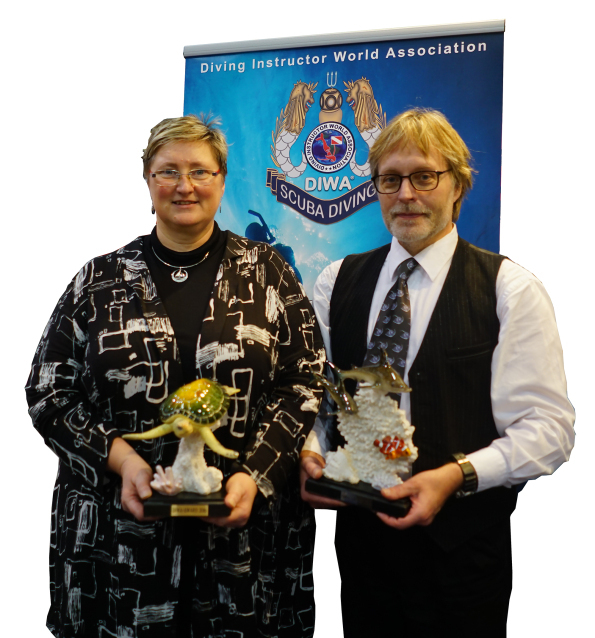 Kerkau’s contributions are significant—she is a pillar of our technical diving community. She has done much to advocate and promote deep technical diving in Europe and German-speaking countries, and her sustained record of excellence in journalism has inspired new people to participate in wreck and cave diving. WDHOF prides itself in acknowledging global stellar diving females, whose contributions are recognised as significant. 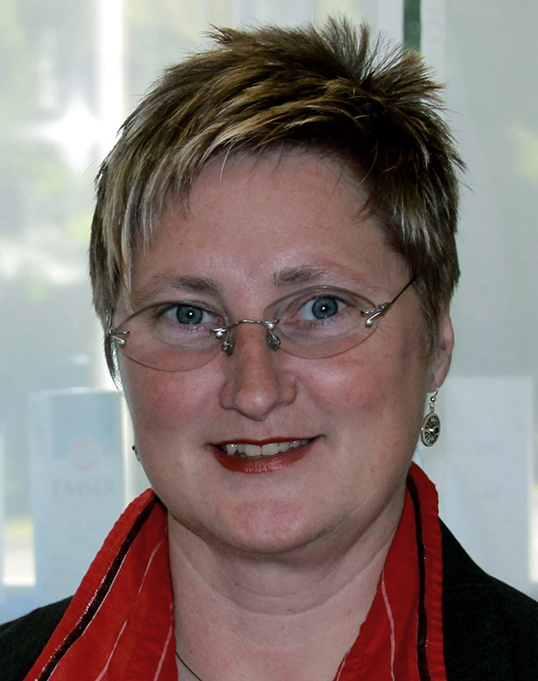 It is appropriate that Sabine Kerkau's work has been acknowledged by the Women Divers Hall of Fame.